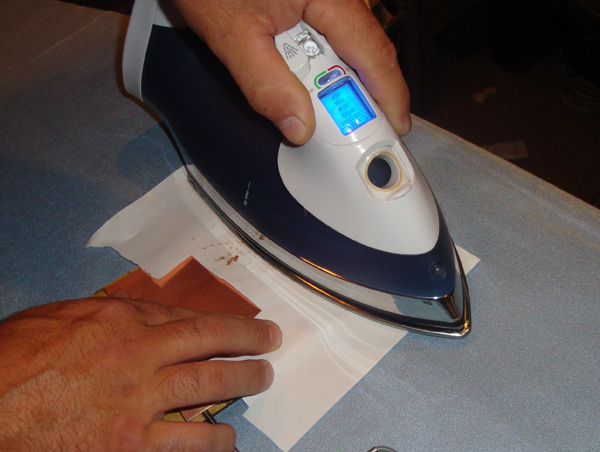 This pictorial describes how to create your own printed circuit board (PCB) using an "iron-on" transfer method. The image below is the "finished product" of this pictorial. 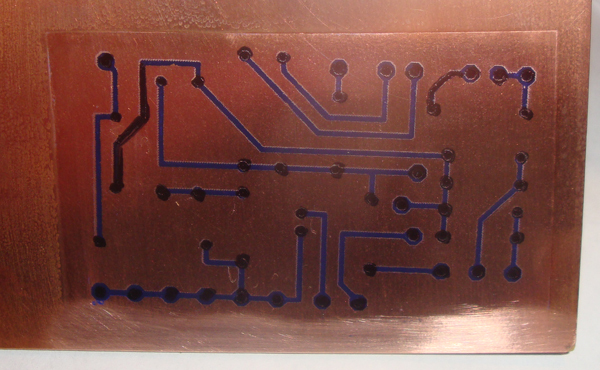 DESIGN - design (or acquire) a PCB Layout. The circuit above is the prototype for the new Rothstein Guitars Overdrive pedal. The layout was designed using EAGLE software. 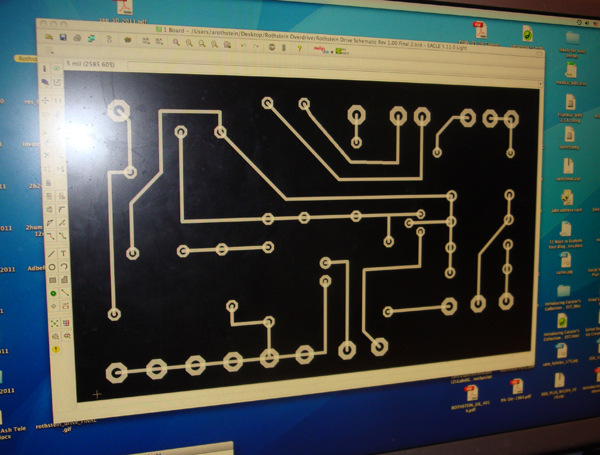 If you are looking to create a PCB for an existing design, there are plenty of layouts available on the internet. 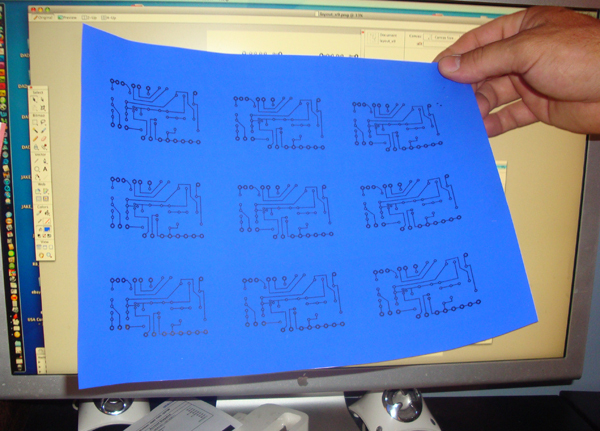 PRINT - print the image onto transfer paper. We really like the Techniks Press-n-Peel Blue. TOUCH UP - If you get any spots that are not dark enough, you may touch up either with a good sharpie pen. 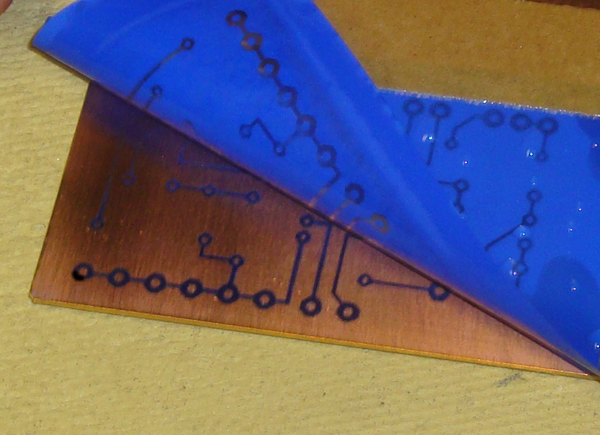 ETCH - use etching solution available at Radio Shack (whch is Ferric Chloride) which will break down any of the copper not covered via the black ink. The layout has been designed using EAGLE sofware. We printed out several sheets. Heat an iron to the 275 - 325 range. 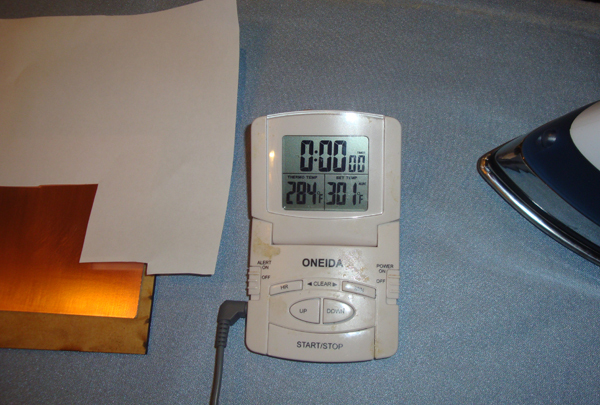 We used a cooking thermometer to verify the temp of the iron. Text.... Iron away for approximately 3 - 4 minutes. We prefer to cover the transfer paper with a layer of standard white paper. Next is time to drill out the holes. 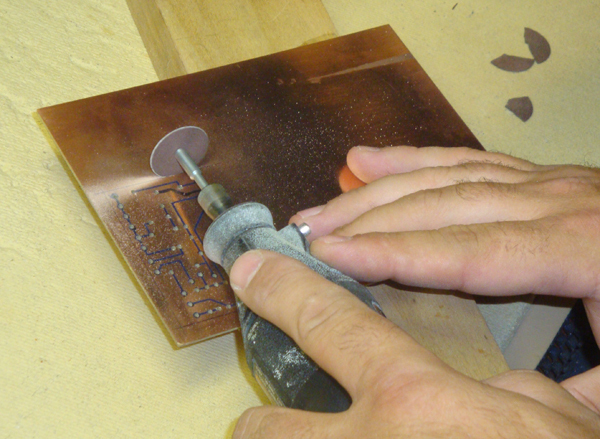 We prefer to use a drill press, however you may use a Dremel. Any lines that do not appear dark enough, or any pads that are too small can be thickened simply by going over the area with a sharpie. Cut down to size. 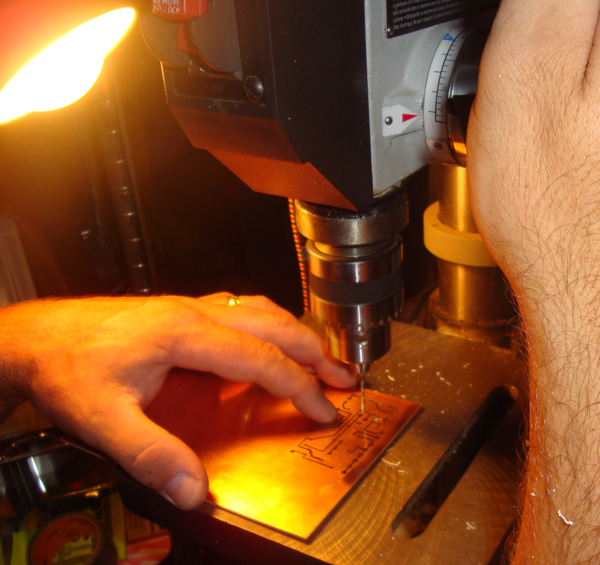 We prefer to use a dremel for this. 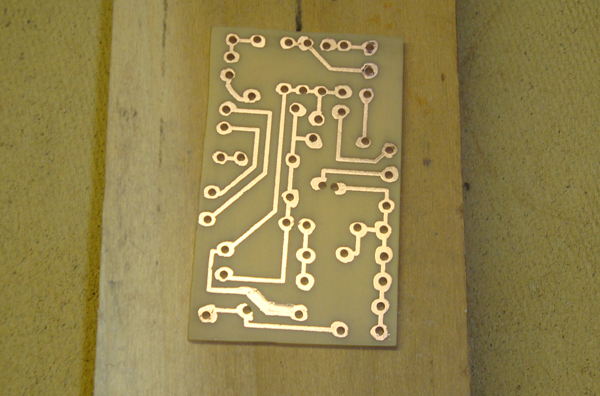 The PCB is now ready to get a bath in the etchant. All the black line and holes you see will resist the etchnat. 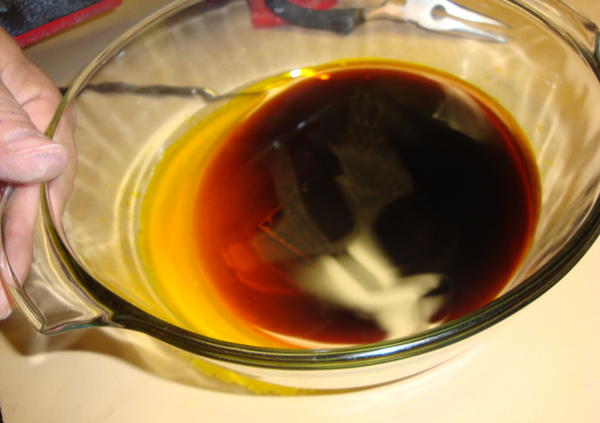 Everything else will be removed by the etchant. 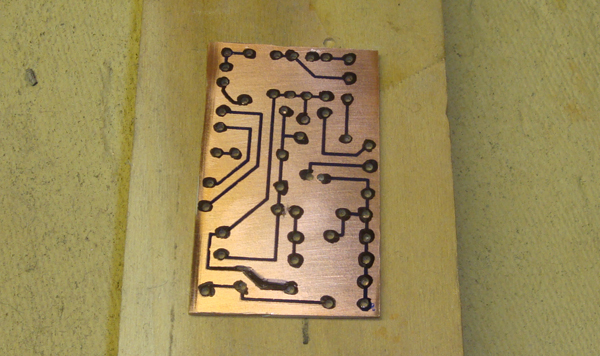 The PCB will require a 20 minute bath in the etchant solution. It is important to keep the solution moving which can be accomplished by gently rocking the bowl. Also make sure the solution is NOT cold. This should be done in a WELL VENTILATED AREA, and remember to wear rubber gloves and protective glasses. There is a step that is not show. 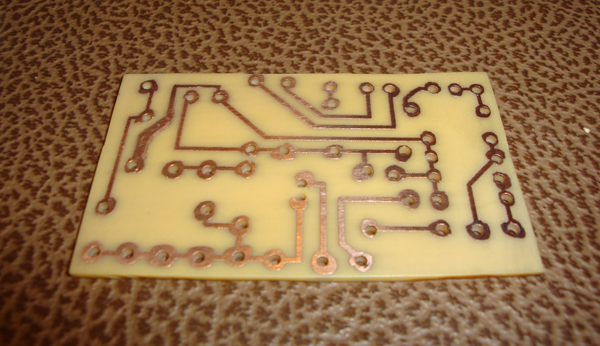 When the PCB is removed from the etchant, the traces wil all be black. You will need to sand again with steel wool to remove the black. After using the steel wool you will have something similar to what you see below.